Welcome! This is the web site of David van Geyn. The link to the web mail login page can now be found near the top of the page or by clicking here. Note that you can also just type mail.vangeyn.net in your browser to automatically jump to the web mail login page. Please check out my photo gallery, or if lacking time, the page of some of my best photos. Some of the websites I have done work on are linked to on the left side of this page under the title 'Website Work'. I enjoy photography and invite you to look at some of my photographs. Some of the best photographs can be found here. Other photographs and a larger subset of photographs can be found in the photo gallery. The photo at the top of the page is the peak of Blackcomb mountain, as viewed from the Whistler alpine. 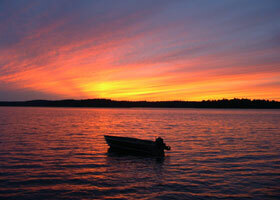 The sunset photograph on this page was taken at Kennisis Lake, near Haliburton, Ontario, Canada. You can contact me by sending e-mail to my first name (i.e. david) at the domain of this site.